Did you know one of the most pungent products in your cupboard is also the most beneficial? Apple cider vinegar has the ability to help with everything from your health to your skin to your hair. Plus, it’s also a great addition to many foods and drinks! In fact, we’ve rounded up 101 uses for apple cider vinegar that are sure to blow your mind. When you’re choosing an apple cider vinegar, make sure to get one that’s organic and contains “mother”. This indicates your ACV is of the best quality. Mother is an amino acid-based substance that combines enzymes, proteins and probiotic bacteria. 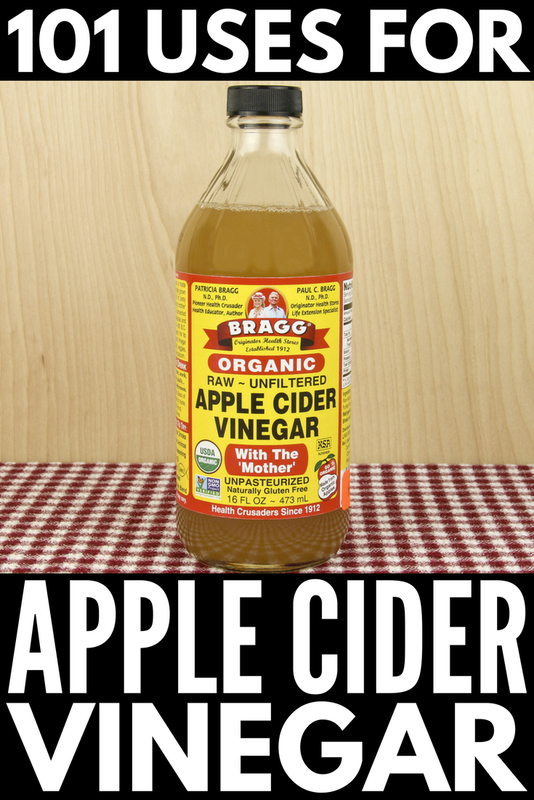 The best apple cider vinegar with mother has long been Braggs Apple Cider Vinegar, so it’s always a great bet! The health benefits of organic apple cider vinegar with mother are plentiful. It helps balance your body’s pH, which detoxes your system, cleansing your liver and easing digestive ailments. And it also helps stimulate circulation. Not only that, it’s been shown to improve heart health, lower blood pressure, and fight against free radical damage. As you can see, the healing power of apple cider vinegar is very strong, so it’s something you should be incorporating into your diet every day. There are also multiple apple cider vinegar uses for women, specifically. Along with beauty hacks like using it as a face toner and hair mask, apple cider vinegar also helps around that time of the month. It works to eliminate cramps and lessen PMS symptoms, plus it helps get rid of yeast infections. And if you’re looking to lose weight, apple cider vinegar is one of the best things to add to your daily regimen. It makes you feel full, curbs your cravings, and helps get things moving. If you’re feeling sluggish, apple cider vinegar can help boost your energy naturally. It contains potassium and enzymes that can bring you up when you’re feeling exhausted, especially after a tough workout. If a lack of energy is a problem for you, add apple cider vinegar to a glass of water or a smoothie to kick your energy up a notch. There are many ways to use apple cider vinegar, so it really depends on what exactly you’re using it for. You’ll often need to dilute it with water or other ingredients, especially if you’re eating or drinking it, or putting it on your skin. You can use it in salad dressings, tea blends, smoothies, baking, soups and more. Plus, you can create an all-purpose cleaner or use it as a dish detergent. It can be used as a deodorizer, or weed killer, and you can use it to clean your makeup tools and tooth brush. The list goes on and on. Take a look at 101 uses for apple cider vinegar and start reaping the benefits in your day to day life. There you have it, a whopping 101 uses for apple cider vinegar. Did they blow your mind? If you liked this compilation of 101 uses for apple cider vinegar, please share it on Pinterest! And if you’re looking for more health tips and trick, please follow our Health board on Pinterest!